It seems as if every day is dog day around here. We get up thinking about the needs of our dogs. And because our dogs come to work with us, their wants and desires always seem to be our number one priority. It’s a wonder we’re able to accomplish anything at all, except where our dogs are concerned. Nevertheless, there is quite a bit happening here at The New Barker Dog Magazine, and more things are being added weekly. We have been named the Official Dog Magazine for Florida’s Largest Home Show and Spring Fling Adopt-A-Pet at the Florida State Fairgrounds, March 15-17. We’ll have a staging area with programs, demonstrations and short seminars going on throughout the weekend. Rescue groups who are interested in participating are encouraged to contact Rick Medina at Animal Based Charities. 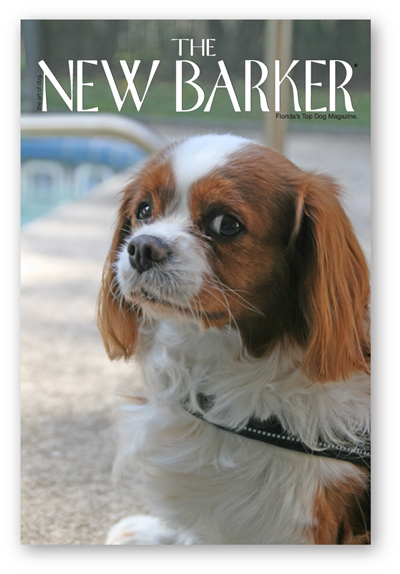 Pet-related vendors should contact The New Barker at info@thenewbarker.com. The New Barker is once again the official dog magazine for this year’s International Combined Driving Event at Little Everglades Ranch in Dade City. While this is an amazing Equestrian event, dog lovers will get a kick out of the Jack Russell Terrier Races being held on Saturday, February 23. We will have some tickets to give away, so be sure to sign up for Weekend Pup-Dates and The New Barker Facebook page for upcoming details, and your chance to win. The New Barker is also a co-sponsor of the Jacksonville Humane Society’s Mutt March (March 2 at The Jacksonville Landing) and the Humane Society of Manatee County’s Paws in Motion (March 9, Downtown Bradenton’s Riverwalk). We’ll be busy in March with our duties as the official dog magazine for events like the 6th Annual Doggie Derby in Orlando, the Annual Dog’s Day in Dade City, and the 4th Annual Florida Wiener Dog Derby in North Fort Myers. Hint: Bookmark The New Barker calendar to check for updates. And the fun doesn’t slow down in April. We’ll be at the 7th Annual PawFest on Saturday, April 6 in Largo, as their official dog magazine and co-sponsor. This has always been a fun event for the entire family. We’re also looking forward to the 2nd Annual Chasco Fiesta Pet Adoption Fair on Saturday, April 13 in New Port Richey. Interested in participating as a vendor or rescue group? Call Linda at 727.501.1444 for PawFest and Kristen at 727.842.7651 for the Chasco Fiesta Pet Adoption Fair. April 28th kicks off the season’s Bark in the Park series at the newly renovated McKechnie Field, home of the Bradenton Marauders. The New Barker has been asked back as the season’s Official Dog Magazine for each of the five Bark in the Parks. There will be games, raffle prizes and plenty of giveaways. And, be sure to stay Pup-To-Date for details on the upcoming Ray’s Bark at the Ballpark, scheduled during baseball season at the Trop. We’ll also be doing the annual Bark in the Park with the Tampa Yankees. We are especially fortunate (okay, and excited) to be working on a fundraising project for Olive’s Way, featured in the winter edition of The New Barker. Partnering with the Columbia Restaurants to bring a very special Wine Tasting Dinner, the April 30th event will raise money to benefit the Oncology Department at the University of Florida Small Animal Hospital. Our special guest will be Jeremy Foley, Athletic Director for the University of Florida. His chocolate Labrador, Gracie, who was featured in the very first issue of The New Barker in 2006, was a recent patient at the UF Small Animal Hospital. Tickets will be available soon, so stay close to The New Barker social media tools for details. Dog of the Week: Meet Sam, a five-year-old Cavalier King Charles. He is current on everything, gets along well with humans and other dogs and cats. If you adopt Sam, he will want to be with you everywhere you go. A real champ of a lap dog. A Very Important Pet daycare, boarding and grooming, is fostering Sam. Call them at 727.446.6700 for details. Previous Previous post: Because of You. Next Next post: All You Need Is The Love Of A Dog For Valentine’s Day.